Well, we’re officially experiencing cuteness overload. Last night Republican presidential nominee Donald Trump was sitting down with his family for supper, when, to the absolute delight of all gathered at the table, little Barron Trump came downstairs with Mike Pence, whom he had dressed up like his favorite toy soldier. Regardless of how you feel about Donald Trump’s polarizing campaign, you’ve got to agree that this is officially the most adorable thing that’s ever happened! The entire Trump family cooed in delight as little Barron proudly displayed Governor Pence in his adorable soldier’s cap and red uniform. “Here is General Mikey reporting for duty,” Barron announced as the Republican vice presidential nominee marched into the center of the Trump family’s dining room in his toy soldier costume. “General Mikey, salute!” Barron commanded in a stern voice that caused a ripple of good-natured chuckling among the delighted Trump family. His older brother Eric Trump tousled young Barron’s hair. “What a handsome soldier he makes, my little man!” he said with an ebullient wink, taking joy in the youthful earnestness of his brother’s make-pretend. “I daresay he looks ready to lead a battalion against ISIS! You’ve done a fine job!” Young Barron blushed with pride and Donald Trump couldn’t help but let out a mirthful laugh at his son’s gentle bashfulness. The cuteness factor went off the charts when Barron took out a toy bow and arrow and began firing arrows tipped with suction cups at Mike Pence, who remained still and expressionless in his toy soldier costume. “General Mikey is under attack!” Barron shouted with glee. One of Barron’s arrows hit Pence directly in the stomach, and the vice presidential nominee doubled over and fell silently to the floor, which caused the whole Trump family to laugh with merriment at the precocious young Trump child and his irrepressible imagination. If that epic level of cuteness doesn’t completely make your day, you officially have no soul! Unfortunately, even the most adorable things in the world need to come to an end, and eventually Barron’s family had to let him know that playtime with Governor Pence was over for the time being. “Thank you so much for sharing General Mikey with us, Barron!” said Donald Trump Jr. “But now it is time for supper, and so we must put him away for a while.” Eric Trump dragged Mike Pence, still in his toy soldier costume and makeup, underneath the dinner table, where he lay silently while the Trump family enjoyed a meal as filled with merriment and love as it was with sumptuous delicacies. Wow! This is definitely the most heart-melting story from the election so far! 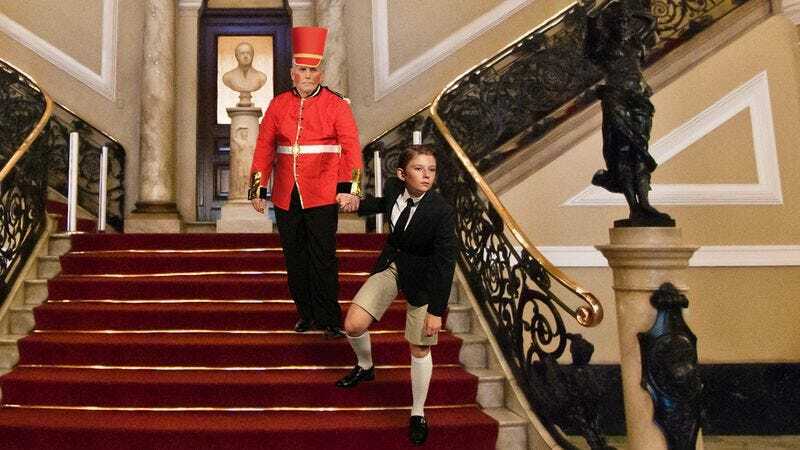 We just wish we were there to see Barron Trump dress Mike Pence like a toy soldier in person. We can’t wait to see what kind of mischief the littlest Trump and his playmate Mike Pence will get into next!